No matter what your favorite sport is, nothing quite compares to the unique atmosphere of watching the big game among friends and fellow fans at a sports bar. When you don’t have time to catch the game in person, sports bars are an excellent alternative. With great bar food, great drinks, and a lively atmosphere, Oklahoma’s best sports bars will give you a night to remember. Here are our favorites! Sports Illustrated recognized Eskimo Joe’s as one of the top 10 “Perfect College Sports Bars.” It’s close to the Boone Pickens Stadium and a favorite all year round of OSU Cowboys. Make sure you get one of their T-shirts, which are said to be one of the most collectible in the country. Upscale bar food, including vegetarian options like as chickpea burger, and plenty of TVs make this one of OKC’s hottest places to watch sports events. It’s located in the Classen Curve district, from the restauranteurs of the Good Egg Group. Craft beer, pizzas and sports. This restaurant and brewery is right across the street from the Tulsa Driller’s ONEOK field. You’ll also find some great stadium style food, like pretzels and wings. Live music, 11 televisions, 14 beers on tap and great food combine at this local hangout close to ONEOK field. Voted Tulsa World’s “Best Sports Bar,” it’s a great place to hang out, watch the game and grab a bit to eat. Come out for Monday Night Football, Thursday Trivia Night or the Saturday game in the fall. This has got to be one of Norman’s favorite sports bars. Lumpy’s is a neighborhood favorite for burgers, ale and sports. There are two locations, one on NW Expressway and the other on North May. The menu has pub food and some upscale options if you’re looking for something special. You’ll find college games and NFL at this place, so come out for a great time. On big game days, you’ll want to get there early, as this place fills up quick. 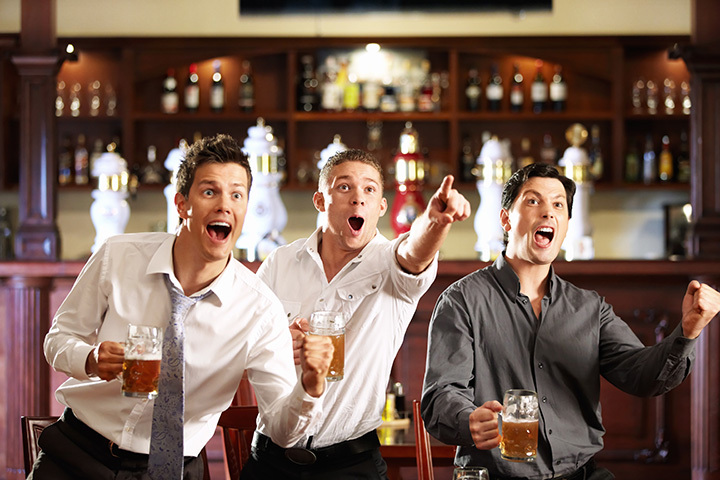 Lots of televisions around the restaurant make it easy to catch the NBA finals, college football, NFL and more. The food gets great reviews on multiple platforms. With 18 flat-panel, high-def TVs in this restaurant, you’ll be able to watch the game in comfort while enjoying a great meal. The lunch menu is fairly standard, but the dinner menu has some neat items, like “Not Your Normal” alfredo pasta, made with bleu cheese and jalapenos, and served with blackened chicken. This local pub features good food, TVs and lots of beer. It’s a favorite in the community for a great evening of fun and entertainment, even when there isn’t a game. UCO may not be a top 10 college, but that doesn’t mean the students don’t enjoy a good game. The Zu is a fairly new bar in town, but it’s part of the Othello’s Restaurant Group, which has a good reputation. They feature five projector screens, 10 beers on tap, and a fantastic wine selection.